Most packages arrive in 2 to 5 business days in US/48 States. Free Shipping is available for orders delivered in the United States (continental 48 states only). Pick the Flat Rate Shipping ($7.99) option at checkout for any size order. Orders before 2 PM ship on the same day! Flat Rate Shipping can be a really great deal if your order is medium to large. Flat Rate Shipping is available for orders delivered in the United States (continental 48 states only). Yes, we do our best to keep prices low! To offer you the best prices, our cart calculates both US Mail and FedEx rates based on the weight of your order to your location. USPS Priority Mail Shipping is a good value for medium sized orders (under 2 pounds). USPS Priority Mail Shipping starts at about $7.50. USPS Priority Mail is the best option to Alaska, Hawaii, Canada, and most addresses worldwide. USPS Express delivers to most addresses on Monday-Saturday. FedEx Ground is the best value for larger orders (over 2 pounds). FedEx Ground Starts at about $11.00. 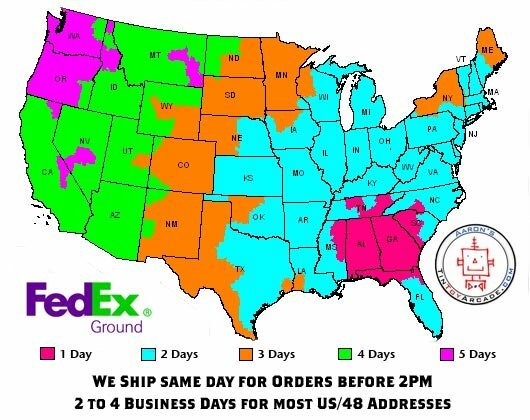 FedEx Ground delivers on Business Days (Monday-Friday). FedEx Express is the fastest option for shipping within the US. Our Cart will display FedEx Express shipping times and prices to your address. Just pick the best option from the "Calculate Shipping" list in your shopping cart. USPS Express Mail is a faster option for shipping in the US and Worldwide. Our Cart will display USPS Express Mail shipping times and prices to your address. USPS Express delivers to most addresses on Monday-Saturday. Orders received before 2 PM EST on a business day will be shipped the same day. Orders received after 2 PM EST will ship the following business day. FedEx Express delivers on Business Days (Monday-Friday). E-mail Orders@TinToyArcade (or click Contact Us), if you have any questions about shipping.